Shinto : Jojo saku ranking : Owaza mono cutting test ranking : Settsu province. This sword belongs to Saijo saku ranking. The blade is polished by high ranking polisher. Habaki : Gold wrapped double Habaki. Blade length : 73.64 cm or 29.0 inches. Sori : 1.64 cm or 0.65 inches. Width at the Hamachi : 2.98 cm or 1.17 inches. Width at the Kissaki : 2.18 cm or 0.86 inches. Kasane : 0.71 cm or 0.28 inches. 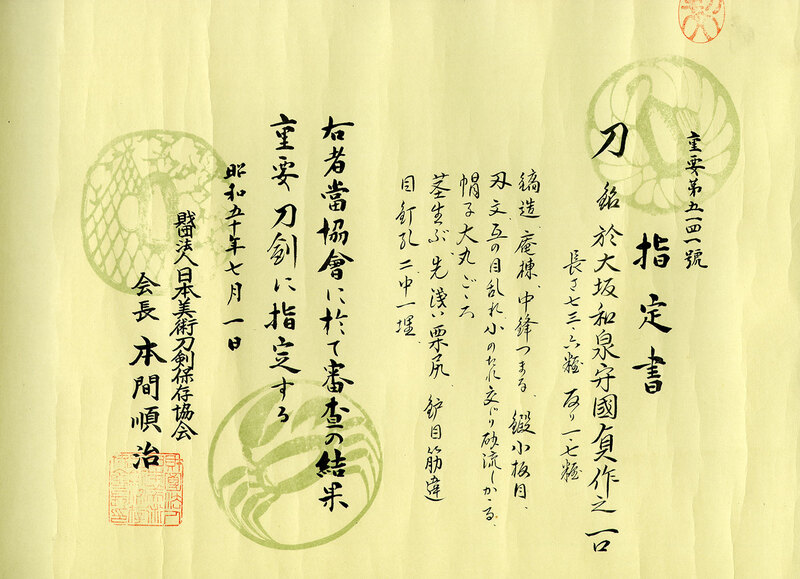 Era : Edo period Kanei era. 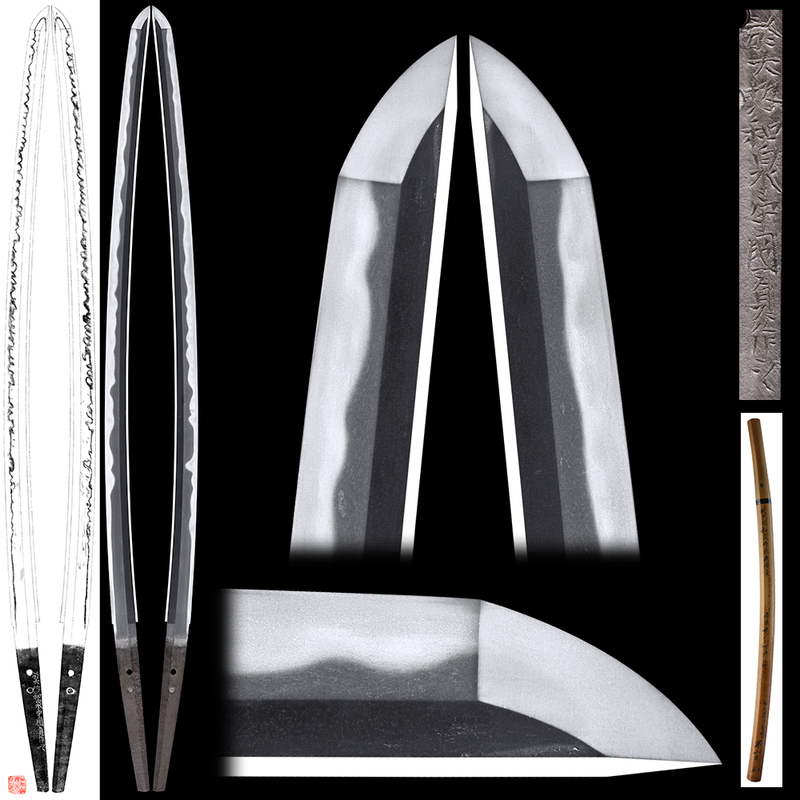 Shape : The blade is rather longer size and regular width, thickness with suitable curve and long Kissaki nice looking shape. 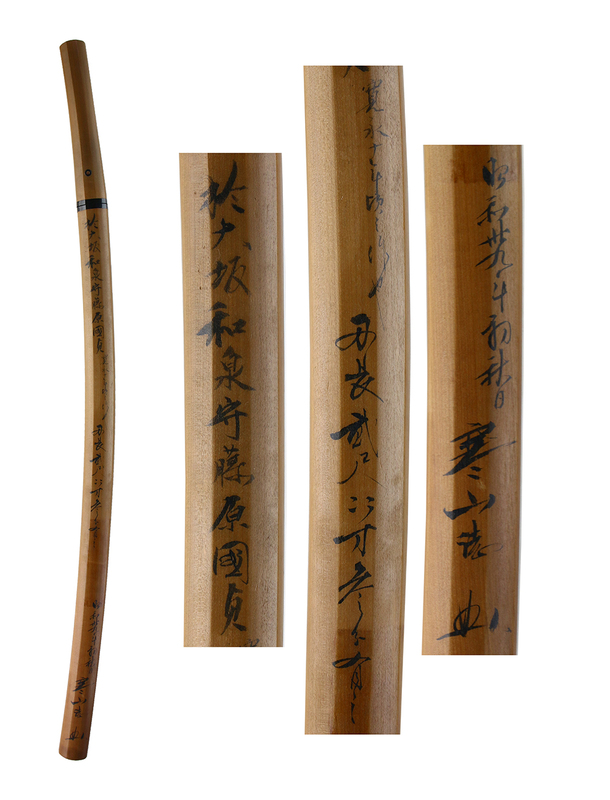 Jigane : Koitame-hada well grained with Jinie attach and Chikei work. Shinogi texture : Koitame-hada well grained like Hiraji and also small Masame mixed. Hamon : Suguha From Hamachi, and then changes to Gunome Midare with thick deep Nioikuchi. Sunagashi and small Kinsuji work active. Nakago : Ubu , shallow Kurijiri style, Yasurime is Sujikai. Special feature : Izumi Kami Kunisada the first generation was born at Hyuga Kyushu and forged the swords. And then he moved to Kyoto and started to study under the Kunihiro school. 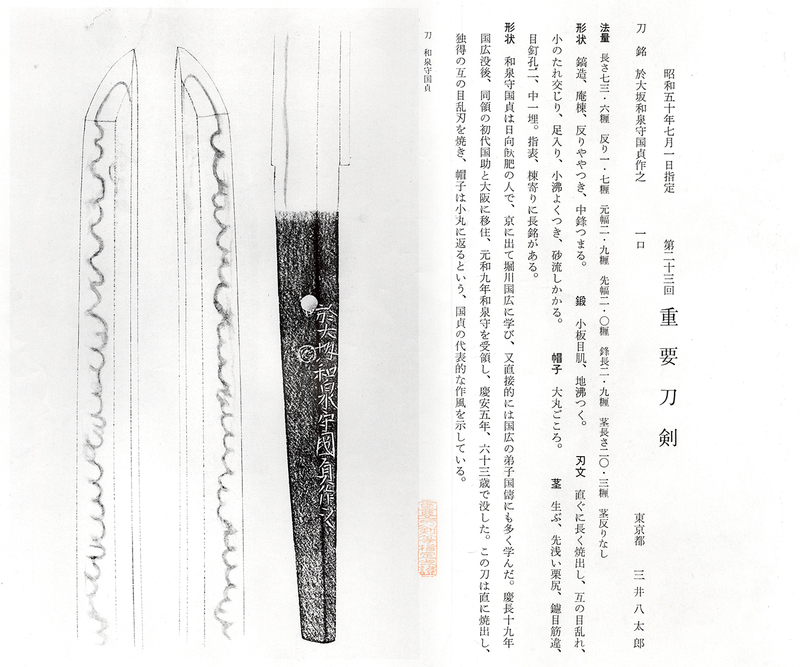 He also learned techniques from Kunitomo with his friend Kawchi Kami Kunisuke the first generation. Their swords style are very similar to Kunitomo. At Keicho 19th after Kunihiro died, He moved to Oosaka with Kunisuke. He died at age 63, on Keian 5th (1652). This sword is Suguha Yakidasi and then changes to typical Gunome Midare and Boshi turns round shape which is typical style of Kunisada.